Hoping to raise awareness of the threat to the survival of the Porcupine Caribou Herd presented by the proposed exploitation of the oil and gas reserves in the Arctic National Wildlife Refuge, the husband-and-wife-team of filmmaker Leanne Allison and wildlife biologist Karsten Heuer, follow the herd of 120,000 caribou on foot, across 1,500 kilometers of rugged Arctic tundra. They let the caribou guide them through a wild and remote landscape, from Old Crow, Yukon, to the Arctic National Wildlife Refuge -- the herd's calving grounds -- and back. During the five-month journey, they ski and hike across mountains, swim icy rivers, brave Arctic weather and endure hordes of mosquitoes. They survive an encounter with a hungry grizzly bear that forces them to reconcile what it means to be a part of true wilderness. Dramatic footage and video diaries provide an intimate perspective of an epic expedition. This film presents undeniable evidence that gives the lie to then Sen. Frank Murkowski's (R-Alaska) disgenuous description of the Refuge as "flat, unattractive, not pristine" as he held up a piece of blank white foam board. 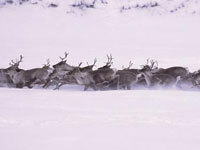 Watching the caribou migrate suggests a more appropriate analogy. The Arctic National Wildlife Refuge is America's Serengeti. Note: To create a shorter version more suited to classroom and group use, the National Film Board of Canada condensed the original 72-minute film down to this 54-minute version. The film loses little of the powerful storytelling, biological insights or outstanding adventure of the original film. "This is a heartfelt and inspiring northern adventure which succeeds at revealing the powerful beauty and sacredness of the caribou and their habitat." "A stunning documentary about precisely what drilling for oil in the Arctic National Wildlife Refuge would destroy, and, hopefully, it will close the debate forever." "Recommended for public and school libraries." "Captivating from start to finish...breathtaking views of both scenery and wildlife...Truly a respectful glimpse into wildness largely unseen by human eyes. Anyone who has heard of or read about the issues surrounding the Arctic National Wildlife Refuge should view this film." "This is a film of beauty and courage." "A riveting look at the epic migration of tens of thousands of caribou, across equally epic, ruggedly beautiful terrain." "This multi-award winning, poignant documentary will leave few people untouched." "Being Caribou is about birth, death and survival... It is a 'must see' for all those who are in favor of destroying a pristine natural environment along with all life forms in it, to gain a few barrels of oil. Highly recommended for high school, college and public library collections." "Beautiful, thought-provoking...Being Caribou is highly recommended."